I’ve professed my un-love for pumpkin pie before. I just…I just don’t love it. I wouldn’t necessarily consider myself a hater. It’s just not something I crave. But I was determined to give you a pumpkin pie something this holiday season. And I think you’ll enjoy this. I did. And from a pumpkin pie un-lover, that speaks highly of this dessert. Actually, if you were paying attention, you already had a sneak preview of this pumpkin pie sheet cake. I included it in my step-by-step Thanksgiving plan last week and a few of you picked up on that and deserve Mel’s Kitchen Reader of the Year for actually reading the fine details of what I blab about on here instead of just skimming. You are awesome. All two of you that noticed. There really aren’t any secrets or shockers with this recipe. In fact, I think the smooth, creamy pumpkin topping is almost exactly like traditional pumpkin pie filling from the back of that famous Libby’s can. The difference is that the crust on this sheet cake is a thicker layer than traditional pie crust and is buttery and cakey and totally delicious. And of course because it is a sheet cake, it’s made in a 9X13-inch pan instead of a pie plate. 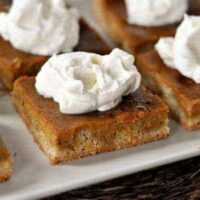 Anyway, these little pumpkin pie bars are awesome. Love, love, love them. I think it has a lot to do with the crust to filling ratio matching up a little better than the wimpy, thin pie crust in the original pumpkin pie. If you just can’t break away from classic pumpkin pie, that’s ok. While you are eating your slice, I’ll be devouring my bar(s). Preheat the oven to 350 degrees F. Place an oven rack in the middle of the oven (too low and the crust will burn). For the crust, whisk together the sugar, flour, baking powder and salt. Pour in the melted butter, vanilla and egg. Stir to combine (I use my hands at the end to combine the dough into a cohesive ball). Press the dough into the bottom of a lightly greased 9X13-inch pan. For the filling, you can use the same bowl that was used for the crust as long as there aren’t any large clumps of dough remaining in it. Whisk the eggs until light and creamy. Stir in the sugar, salt, cinnamon, ginger, nutmeg, cloves and pumpkin. Whisk to combine. Stir in the evaporated milk or cream. Bake for 35-45 minutes or until a knife inserted into the middle comes out clean. Don't overbake or the crust will be too tough. Cool completely. Cut into squares and serve with sweetened whipped cream. Love it. Its very easy and tasty recipe. 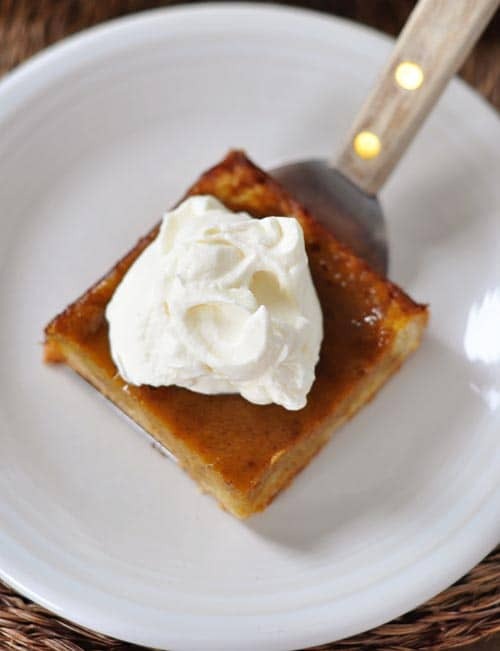 Absolutely delicious, easy to make, and a great addition to our Thanksgiving dessert buffet. I love pumpkin pie, but this was even better. It’s all about that crust/cake layer . Glad you loved it, thanks Karen! Easy and delicious, way easier than making a pie, feeds more people, and brought many compliments! Crust tastes like shortbread. Double recipe fits a half- sheet pan. Tip: add 1 tsp vanilla to filling to enhance flavor…I do this to a pumpkin pie also and it really makes a difference. I can always tell when a pumpkin dessert doesn’t have this addition! Just made this (yes in march) with fresh pumpkin. It was pretty liquid before I put it in the shell so I added an extra 15 ounce can pumpkin to it and didn’t change any of the seasoning and it is delish!!!! I made this for my ill mother who was dying for pumpkin pie, but didn’t have the energy to make it. This recipe is so much easier than a pie, and unanimously better too, so I made it twice in one week. Thanks Mel. I have a question about the crust. It seemed slightly runny, with no chance of forming a “cohesive ball”. More like a thick puddle. I added a few tablespoons of flour to thicken it up, and was able to press it into the pan. It didn’t just run, so that seemed pretty good. Hopefully I haven’t messed up the recipe. I guess I will find out when it’s done. I’m wondering if anyone has had the same experience? Maybe that’s how the recipe is supposed to be? I’d like to hear from others who have made this about the texture or wetness of the crust. Hi Jamie – the texture of my crust sounds like it was definitely thicker than yours – able to be pressed into the pan (like a shortbread almost but a little softer than that). Update on freezing- I froze it Sunday- weds and served it on thanksgiving and it was great! I think chilling it made it taste even better. I am still enjoying leftovers! Thanks for the recipe and the suggestions! This one is a keeper. I made this for Thanksgiving and it was a HUGE hit. I won’t ever make pumpkin pie again. There is no need. Also I used a bigger jelly roll pan so it was thinner (not on purpose but its all I had). I also just used regular milk (again all I had). This recipe is a winner, winner, winner! Thanks for posting. I mean all your recipes are awesomeness. Made this for Thanksgiving dinner, and we loved it! We are pumpkin pie fans in this house, so my husband was skeptical about straying from tradition, but I like this even better than regular pumpkin pie (even though I accidentally left out the vanilla in the pie crust). I will definitely be making this again. Thanks, Mel! Can I substitute pumpkin pie spice in this recipe? If so, how much should I use? Hi Lindsay – the original recipe uses pumpkin pie spice, I believe, so if you follow the link below the recipe I posted it should give a good tip on that. Good luck! Hi Mel, I just pulled these out of the oven and they look great! I doubled the recipe and used a jelly roll pan (commercial half sheet pan) and there was definitely too much filling, by at least 1.5 cups. I just baked it separately in a ramekin! Yum! I’ll let you know how they turn out! I am making this one for Thanksgiving! It looks soooo delicious! My family loved this recipe! I made it for our annual “pie night” before Thanksgiving and it was a huge success! Your recipes are heaven sent! Rebecca – it should travel fine as long as you keep it nice and cool – perhaps in a cooler? I made this recipe tonight in preparation for Thanksgiving (too much going on scheduling the next few days…) so I was curious- would you suggest storing it in the fridge or freezer until Thursday? I want to make sure it still will taste fresh and amazing when I serve it. Thanks! Kristen – hmm, this far in advance, I’d probably freeze it until Wednesday and then take it out and put it in the fridge (I haven’t frozen it before so I’m not exactly sure how it will fare but I think it should be fine). Good luck! Made this today and it looks and smells wonderful. Seems easier for me than pie to make. I had to cook it for about 55 minutes though. I don’t have trouble with my oven, in fact usually I pull things out a little early. But I wanted to ask if the times were off or perhaps my oven didn’t get hot enough at 350′? Amy – I made it at the time suggested in the recipe but it’s always a good idea to keep an eye on it like you did. Not sure why you needed the extra time but as long as it bakes through without the crust getting overdone, it should be fine. I adore pumpkin pie, and I have a fantastic recipe I use. But I’m definitely a crust person when it comes to any pie, and this looks like the perfect crust/filling ratio. Thanks for the recipe! And happy almost-Thanksgiving! 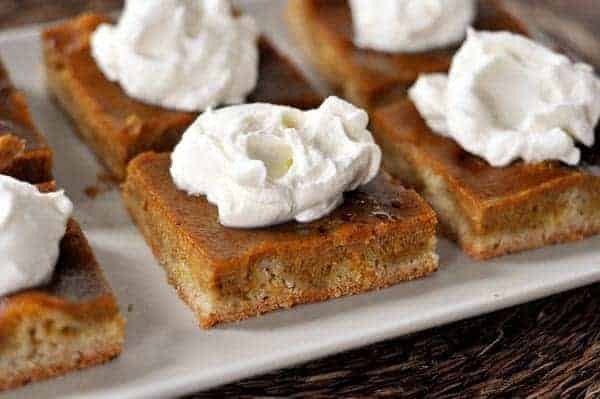 I’ve been looking for an alternative to pumpkin pie and this looks better than any other recipe I’ve found. Does the crust get soggy the next day? If I make it for Thanksgiving, I’d like to bake it the day before? Thank you! Andrea – we had leftovers for a few days and while the crust softens a bit, I actually loved it the day after (it doesn’t get soggy, just a bit softer). I feel similarly about baked pumpkin, but LOVE our family recipe for pumpkin chiffon pie. It’s divine and I look forward to thanksgiving as the one time per year that we get it. You should try it. So yummy! Do you think I could still make this in a jelly roll pan with your recipe? Kinda need mine to feed a crowd. Thanks! aussiemum – I should have included you in my earlier response to Terri – but yes, this can be doubled for a large 12X18-inch pan. What a great idea – I’m not a huge fan of pie of any sort, although I seriously love the pumpkin pie filling. This might be the perfect Thanksgiving dessert for me – yum! I’m making this tomorrow I cant wait! Wondering how it will be if I just double the recipe, see if I make something for my work I have to make something for my husbands also. LOL This looks fast, easy and good! Terri – apparently the recipe doubles great for a large 12X18-inch rimmed baking sheet if you want to try it (I haven’t but the original recipe was for that size). that whipped cream on top is perfection. looks delicious! I have never been a fan of pumpkin pie, but I love pumpkin cake. I think I will love this cake, and I know my family will, too! I love easy peasy sheet cakes, especially amid the holiday rush. This looks so good, Mel! 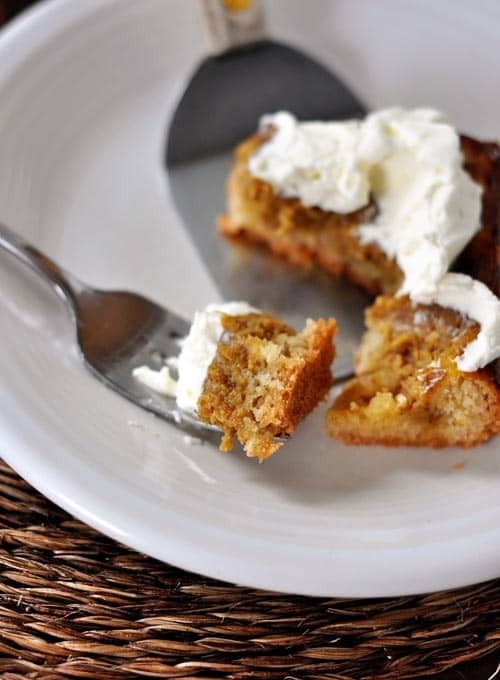 Wouldn’t you know…I just signed up to make “Pumpkin Bars” for my preschooler’s Thanksgiving Feast next week! Guess what I’m going to be making?! Say whaaaaaat?! This looks awesome! Actually, I love pumpkin pie for breakfast. I think this recipe looks delicious and I can’t wait to have it for breakfast, lunch and dinner! I am not a pumpkin pie lover at all. It’s just…weird! I actually hadn’t even tasted it until I was married! HA! I guess pumpkin pie isn’t made in Iraq, or else my dad definitely would have made it haha. But these do look pretty darn delicious! Perhaps these will be the desert I make next week!’ Thanks Mel, you just plain rock. I’m not a pumpkin pie fan either but I did make the pumpkin pull apart cinnamon bread last year and devoured it the majority of it in two days ha ha. This looks like a delish alternative to pie! Treats like this are so much easier for large groups, or to take to a church dinner. I’m going to work this into the menu plan here in the next few weeks. Thanks Mel. Pumpkin Pie is something I’ve only come to love in the past few years. But…I think I could love this cake instead. I used to unlove pumpkin too. Not sure what changed, but I can eat the crap outta some pumpkin pie! Love this sheet cake! This would totally make me happy over pumpkin pie any day. I love simplicity. Love pie, love cake, love you! I feel as you do about pumpkin pie, so I most likely will love these as well. Thanks!